Browse:Home Wirtualna Polska The final matura exam from Lithuanian has been finished! The final matura exam from Lithuanian has been finished! What does peace give to a person? Why is the background important for a person? The treating of a person from social borderline in Lithuanian literature. Vilnius in Lithuanian literature. These are the topics which the students were allowed to choose for analysing when passing their final matura exam from Lithuanian and literature this year. The exam from Lithuanian is the most important subject from all the exams because its results are a crucial factor in deciding whether the person will get into university for studies free of charge. The exam from Lithuanian is compulsory; it is not possible to be given the certificate enabling to start higher education without passing it. 18,759 students wrote the exam on state level, 12,643 wrote it on school level. There were about 1,000 students leaving Polish schools in Lithuania among them. For several years, the students leaving schools of national minorities, including Polish schools in Lithuania, have been passing the exam from Lithuanian on the same conditions as the students from Lithuanian schools. The exam was normalised in 2013. This year the students were allowed to choose one of the four topics: two of them demanded the work in a form of critical essay and two of them were the analysis and interpretation of literary work. In their writings, they had to refer to literary works of three Lithuanian writers. The first subject was: “Kas žmogui teikia ramybę?” (What does peace give to a person?). It was expected that the subjects will be expanded on the basis of life and works of Antanas Baranauskas, Juozas Tumas-Vaižgantas and Jonas Aistis. The second option was: “Kodėl žmogui svarbi jo kilmė?” (Why is the background important for a person?). The students had to explain it on the basis of life and works of Jonas Radvanas, Šatrijos Ragana and Czesław Miłosz. Those who chose the topic “Požiūris į visuomenės paribio žmogų lietuvių literatūroje” (The treating of a person from social borderline in Lithuanian literature) were expected to include the works of Jonas Biliūnas, Jurgis Savickis or Marcelijus Martinaitis in their writing. The students who decided to reflect on “Vilnius lietuvių literatūroje” (Vilnius in Lithuanian literature), had to refer to the works of Maironis, Judita Vaičiūnaitė or Jurgis Kunčinas. It was obligatory to include at least 500 words in the essay. The students writing the final exam had four hours for completing it. Some of them left the room where the exam was taking place more or less after three hours, some used all the time that was set. In opinion of the students from John Paul II Gymnasium, who were passing their final exams in the building of ORT Vilnius Sholem Aleichem Jewish Gymnasium, the topics were not difficult and the authors were familiar figures. The majority of students who talked to Wilnoteka decided to write a critical essay. During the exam on both state and school level the students were allowed to take advantage of the dictionary of Lithuanian, Polish-Lithuanian dictionary or Russian-Lithuanian dictionary. One has to get at least 30% of the points to pass Lithuanian language exam. The results of state exam will be announced on the 3rd of July, the results of exam on school level will be known on the 16th of July. For the students who are going to study in Lithuania it will not be easy and calm time as it depends from their results whether they will get into university for studies free of charge. Matura exam from Lithuanian is crucial even in the case of medical studies. Even if the grades from chemistry and biology are very high, the low grade from Lithuanian language exam may blight the chances for studying on medical faculties that are being so popular nowadays. 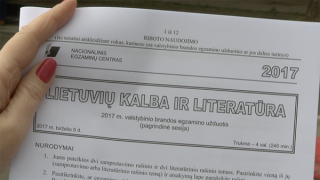 When talking to Wilnoteka, students passing final matura exam admitted that they had to commit a lot of time and efforts to learn Lithuanian literature even if it was at the cost of other subjects. Those who are going to study abroad could restrict themselves to exam on school level, but, as they say, the ambitions prevailed.